Best-selling author Marcia Gruver’s southern-comfortable roots lend touches of humor and threads of faith to her writing. When she’s not pounding a keyboard, you’ll find her clutching a game system controller, riding shotgun on Texas Hill Country treks, or sipping mugs of hot tea on the front porch. Lifelong Texans, Marcia and her husband Lee have five children, thirteen grandchildren, and two great-grandchildren—so far. His last letter arrived on April 15, four months ago to the day. Before now, a few weeks had been the longest span of time between letters. The wait for word had become Willow’s obsession, and a trip to the post office a part of Cletus’s daily routine. Some days, like today, he took the surrey, and Willow rode along with him. At the post office counter, she knew no letter awaited her, even before her turn came to be served. The clerk avoided her eyes as she moved forward in the queue, then tucked his chin and cleared his throat when she stepped up to the window. She gave him a trembling smile and hurried outside. Willow’s heart lurched. Hearing Julian’s name mentioned in the same breath with a Yankee musket wasn’t exactly a comfort. They rode in silence again, though not the heavy quiet of dread. Willow sat back and rested her mind. God had used her, as unlikely as she was, to answer Cletus’s prayers for his daughter. She would lean on God now and trust He heard her many petitions for Julian. She settled deeper into the tufted seat, drowsy in the shade protecting her from the blistering August sun. For the first time in days, she felt at ease enough to drift off in peaceful sleep. Willow leaned to see around him but saw only the horse’s bobbing head. She stood in a crouch beneath the fringed top, holding the back of the seat to steady herself. Past the shimmering heat waves, past the pits and ruts dug in the dirt after the spring rains, she made out the shape of a man waving his arms. A man in slouch hat and Confederate gray. Sick with disappointment, Willow slumped in her seat. Patting tears from her cheeks with her hankie, she fought for control. Hiram mustn’t think she wasn’t happy to see him. The surrey drew alongside him, and genuine joy warmed her heart. She’d missed him more than she realized. Her hands rose instinctively to cover her ears. She turned aside to escape his words, but the dusty road rushed up to meet her. Grasping hands and anxious voices were the last things she knew. I love novella collections because you always get to read a new author plus enjoy some favorites as well. Thank you for being part of the book blitz for “First Love Forever Romance Collection”. I really enjoyed reading the excerpt and would love the opportunity to read the book. I’m excited for this book too. It sounds great! Susie!!! You are totally welcome. Anything to support your work. What a wonderful excerpt. I am looking forward to reading this collection. Thank you for sharing. Me too! I love a lot of authors in this collection. Thank you for being a part of this tour! Much appreciated! I just love these novella collections. They’re so much fun to read! They are. And, the authors in this collection are really good! Another collection! Yay! I really enjoy reading collections. 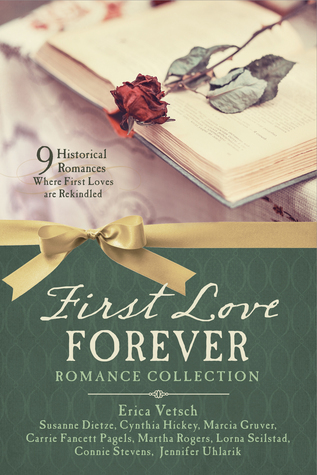 They are a great way to get to know new authors and experience a variety of stories 🙂 I have been looking forward to this ‘First Love Forever Romance Collection’ since I first heard about it! Thanks for being a part of this JustRead BLITZ Tour!! Wow, this excerpt is the most dramatic so far, thanks for being part of the tour! i love how you described a hero. so perfect. the ultimate hero. great excerpt. i love books with collections of stories in them. I love anthologies too. I feel I get a good glimpse into authors I might want to read their full-length works. Plus, I feel so accomplished reading 9 stories in one book! Lol! what a great excerpt. i love books with a collection of stories inside. especially if they are inspirational, historical and have humor. thanks for being a part of the tour. I love anthologies, too! It’s a great way to meet new authors. Thanks for commenting!